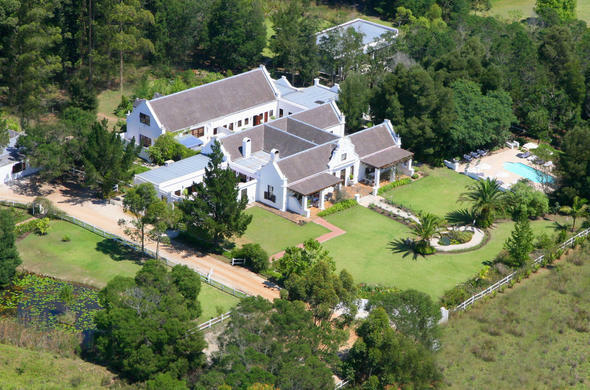 Laird's Lodge Country Estate is situated along South Africa's scenic Garden Route. You can enjoy the tranquil environs or stay busy on the many activities. Laird's Lodge is perfectly positioned between Knysna and Plettenberg Bay with easy access to the pristine beaches, world-class golf courses and magnificent hiking trails, including the world famous Robberg Nature & Marine Reserve and the Tsitsikamma National Park. Experience Whale and dolphin watching, the Outeniqua Tjoe-Choo, oyster tasting, the Knysna Elephant experience and visit the famous arts and crafts centre, while staying at this Garden Route country estate accommodation. This gracious Cape Dutch homestead offers spectacular mountain views, wide open spaces, a secluded swimming pool and gentle walks on the 24 acre estate. The large, high ceiling rooms combine elegance and charm with comfortable, spacious accommodation. This Garden Route country estate accommodation specializes in seafood and game meats, flavoured with fresh herbs from the garden, which allows the kitchen to serve mouthwatering gourmet dinners, fine wines and sumptuous breakfasts. All 15 individually decorated rooms at this Garden Route country estate accommodation emits an ambiance of tranquil elegance and includes cushioned comfort, neutral colours, percale linen and luxurious bath products.